The CIO-DIO48 can control 48 devices or sense 48 contact closures from a single half-size card in a PC. 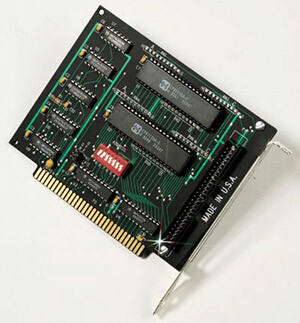 The CIO-DIO48 employs two 8255 parallel peripheral interface chips which are programmable in three modes; simple byte input or output or strobed I/O. The 8255 is simple to program. The CIO-DIO48 can provide 2.5 mA to activate other chips, but not enough for LED’s or relays. The CIO-DIO48H can source 15 mA or source 64 mA, enough for switching most relays and SSR’s. 참고: Comes complete with installation, calibration and test utility, programming libraries for Windows XP SP2/Vista/7, LabVIEW drivers and operator's manual on CD.